Since I've had an interest in maybe getting chickens once we get some land (depending on how much land we get), I did a little reading up on them last year. Do you find this is the case? Is it something you can count on - even set a clock to? Always wondered if this stuff you read really holds true in the real life experiences with chickens. Keep eatin' your greens Whitey! What we do is hang a light in each henhouse that is on a timer. It comes on early in the morning and is set so that the chickens get about 14 hours of 'daylight' each day. The light hangs over the waterer, and in winter we change out the regular 40 watt bulb and replace it with a 250 watt heat lamb bulb. This helps keep the water in the waterer from freezing. As an advocate of natural and organic farming methods, I don't have a problem doing this. I want my eggs, and I do not think it is harmful to the chickens. Example: we're down to just three chickens (will be ordering chicks in spring). Two are nearly 6 years old. While the average natural lifespan for a chicken is 5 to 7 years, they stop laying after 2 years. Commerical egg producers slaughter laying hens after their useful 2 years. I won't go into the inhumane living conditions most laying hens are subjected to, but instead show you what can happen if you treat your chickens right: these two six year olds stop laying every once in a while, but right now we are getting nearly an egg a day. I'm not sure if one or both are laying, but they've certainly beat the statistics. As for Whitey. . . well, she's about 7 years old. I suppose she's earned the right to stop laying--though I suspect the reason we haven't seen any of her itty bitty eggs (she's smaller than the other two) in months has more to do with her spending so much time hacking into my computer and leaving blog comments instead of sitting in a nesting box! Hope this helps. You're going to absolutely love having your own chickens. The only downside is that the compost piles really suffer--pretty much the only kitchen scraps mine get are eggshells, coffee grounds, and citrus peels. The chickens will eat everything else! P.S. We are also planning to build a "chicken tractor" this spring which will allow the hens access to fresh ground to dig and peck in each day. We can't let our chickens roam loose because of the dogs and other predators. Our coops have outdoor runs, though, so the chickens all get plenty of fresh air and sunshine and space to move around. But I'm looking forward to the chicken tractor--it'll serve double duty because we'll have the chickens "prepare" soil for my garden expansion. Much better (and easier) than tilling. What can I do that will prevent bunnies from eating my entire garden? This is the first year I'll plant vegetables since my vegetable-eating dog will pass away before spring, but I realized that even though he will be gone, the bunnies will still be my nemesis. Is there anything I can plant that will deter them? Sounds like you've got quite a large set up, what with all the chicken runs, etc. And I've read about how wonderful chicken manure is for gardens....so hopefully they're making up for what doesn't go into the compost pile by providing a little bit of their own!? Thanks for all the insight. I don't know when/if we'll ever get to have chickens (and a beehive too! ), but hopefully some day!!! Great Blog. I have been reading it a while now. Your chickens and my chickens must be related. 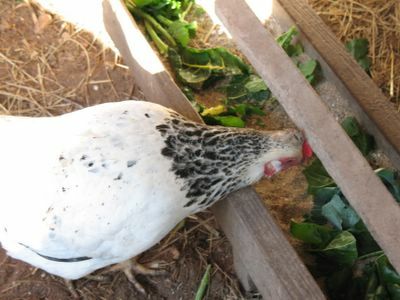 Today mine ate lettuce, kale, endive and arugula topped with black oil sunflower seeds! I also have a Light Brahma (along with 2 Black Silkies, 1 Barred Rock[who is my biggest pig], 2 Rhode Island Reds, 1 Americauna and 1 Golden Laced Wyandotte). They are looking so good right now. All their new feathers are in and Clementine (my Light Brahma) started laying again. I am going to attempt your Arugula pesto. The use of garbanzo beans is intriguing. can chickens safely eat used coffe grounds?